Is this winter or is this spring? With a chance of showers and thunderstorms throughout the week ahead and temperatures in the 50s and 60s, many are wondering where Mother Nature sent away winter to and when it might come back. 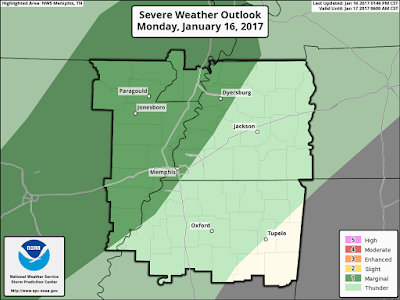 Showers and a few thunderstorms have been rolling through northern Mississippi, Arkansas, and western Tennessee throughout the day on Monday, but will increase in number and intensity into Monday night. A slow-moving system that helped bring lots of ice and wintry conditions to the Central Plains is driving a Marginal Risk (category 1 of 5) for severe weather this evening, mainly along and west of the Mississippi River. The key takeaways from the threat of these storms will be locally heavy downpours, thunder, and brief strong wind gusts. Not every passing shower or thunderstorm will produce these, however. Showers may continue into the overnight hours and early on Tuesday, but the thunderstorm threat should abate by about midnight tonight. Temperatures this evening will fall off into the mid to upper 50s. Winds continue out of the south between 10 to 15 mph. Temperatures will rebound on Thursday, with highs in the mid-60s in the metro, but with an increased chance of showers and thunderstorms as the slow-moving stationary front to our south continues to push out and low pressure develops to our southwest and moves across the area. A couple of those storms could be severe Thursday afternoon and into the evening. However, that rain will give way to a good start to your weekend, with temps nearing 70 degrees and partly sunny skies on Friday into Saturday. Lows remain comfortable for January, in the mid-50s, just cool enough to need a light jacket when taking the kids to school in the morning. As one system exits our picture late this week, another is taking shape over the west coast. 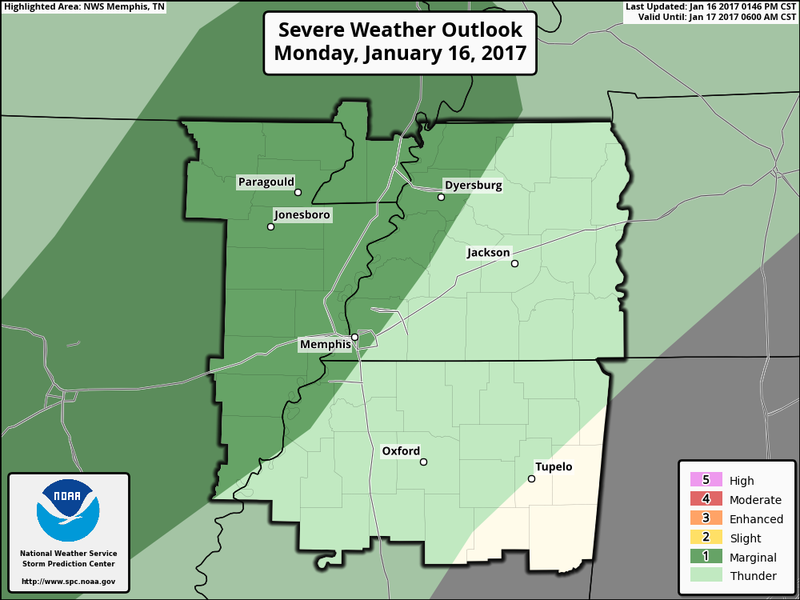 That system could once again bring showers and thunderstorms late in the weekend into early next week to the Memphis area, with the best chance coming on Sunday. A chance of showers continues to hold in the forecast through at least Monday, with temperatures taking a dive into the 50s for highs and 40s for lows to start your next work week. Where is winter, you might ask? Most of the eastern U.S. has been under well above average temperatures for the past week or so. However, long range models suggest that warm pool will be cooling off and winter-like temperatures could make a comeback as soon as the end of this month. 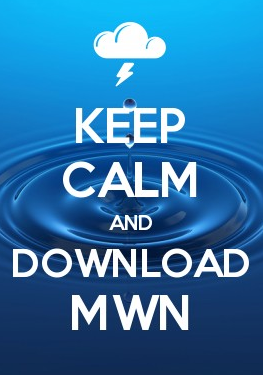 Be sure to stay on top of the human-powered MWN Forecast this week and into the next by downloading the MWN mobile app or bookmarking our website. We’ll provide continuous updates on our social media platforms as well. Links to all of these tools can be found below this post.